Army of Northern Virginia (1861-1865) – The primary military force of the Confederate States of America in the Eastern Theater of the Civil War, the army most often battled against the Union Army of the Potomac. The Confederates created three under the Department of Northern Virginia, which included the Aquia District, led by Major General Theophilus H. Holmes; the Potomac District under the leadership of General P.G.T. Beauregard, and the Valley District, led by Major General “Stonewall” Jackson. The name Army of Northern Virginia referred to its primary area of operation, as did most Confederate States Army names at the time. It was first call the Confederate Army of the Potomac, organized on June 20, 1861, which included all operational forces in northern Virginia. 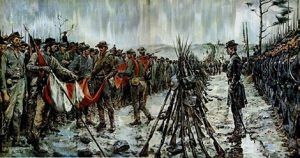 The following month, the Army of the Shenandoah and forces from the District of Harpers Ferry were added. In March, 1862, units from the Army of the Northwest began to be merged into the Army of the Potomac. It was official renamed the Army of Northern Virginia on March 14, 1862, and the following month the Army of the Peninsula was also merged in. The first commander of the Army of Northern Virginia was General P.G.T. Beauregard under its original name – the Confederate Army of the Potomac. He led the army until July 20, 1861, when command was relinquished to General J. E. Johnston. The following day this army fought its first major engagement in the First Battle of Manassas. On June 1, 1862, its most famous and final leader, General Robert E. Lee, took command after General J.E. Johnston was wounded. The Army of Northern Virginia was engaged in several campaigns including the Peninsula Campaign and the Northern Virginia Campaign in 1862; the Chancellorsville and Gettysburg Campaigns in 1863; the Richmond–Petersburg Campaign in 1864–65, and several others. On April 9, 1865, the Army of Northern Virginia surrendered to the Army of the Potomac at Appomattox Court House in Virginia, effectively ending the Civil War, with General Robert E. Lee signing the papers of surrender to General Ulysses S. Grant. The day after his surrender, Lee issued his Farewell Address to the Army of Northern Virginia.